An aquatic bird of the family Anatidae, having a flat bill and webbed feet. Specifically, an adult female duck; contrasted with drake and with duckling. The flesh of a duck used as food. 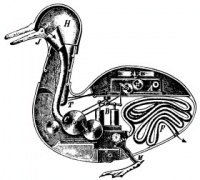 Unless indicated otherwise, the text in this article is either based on Wikipedia article "Duck" or another language Wikipedia page thereof used under the terms of the GNU Free Documentation License; or on original research by Jahsonic and friends. See Art and Popular Culture's copyright notice.